A gastronomic feast for the senses, the 13th annual EAT! Vancouver Food + Cooking Festival, taking place April 26 to May 3, 2015, announces its star-studded lineup today, with tickets going on sale to the general public Thursday, March 5 at www.eat-vancouver.com.The largest festival of its kind in Canada, the 2015 edition of EAT! Vancouver features an expanded eight-day program with more than 35 collaborative workshops, dinners and events taking place throughout Vancouver before culminating in a three-day show at BC Place Stadium May 1 to 3. 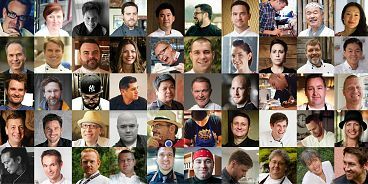 Vancouver’s top chefs welcome their contemporaries from across Canada, bringing them together with artisans, farmers, winemakers, craft brewers, distillers and media from British Columbia and beyond as the city’s vibrant culinary culture is showcased like never before. Chris Whittaker of Forage welcomes Andrew Winfield of River Café, Calgary, AB. Outlandish Shellfish Kitchen Party with Ned Bell of Chefs for Oceans and YEW seafood + bar, and Tim Bedford of Vancouver Aquarium. Beyond the Chop with panelists Sebastian Cortez (Sebastian & Co. Fine Meats),Connie DeSousa (CHARCUT Roast House), and John van der Lieck (Oyama Sausage Co.). Presented in partnership with the Naramata Bench Wineries Association, the Canadian Flavours Gala will roll out the red carpet for a well-heeled crowd of food and wine enthusiasts as top local and visiting chefs present signature dishes paired with first spring-release wines from the Naramata Bench. Price: $15 online, $17 on-site (Adult); $12 online/on-site, $6 on Friday, May 1 before 5 p.m. (Seniors 65+); $9 online/on-site (Youth 13-16); Free admission for children 12 and under. The week-long culinary extravaganza culminates with the EAT! Vancouver at BC Place show May 1 to 3, featuring more than 250 exhibitors celebrating food, drink and cooking. All-new programming takes centre stage, including: VIP Chef Experiences; the“Talk & Taste” Stage; the Canadian Food Artisan Pavilion, sponsored by Edible Canada; the Craft Beer Alley, sponsored by the BC Craft Brewers Guild; an On-site Legacy Liquor Store; as well as appearances by luminary chefs such as Rob Feenie,Vikram Vij, Ned Bell, Anna Olson, Susur Lee and Mark McEwan. *Full programming, exhibitor and event details for EAT! Vancouver at BC Place will be revealed soon.